The brown plastic display ribbon cable clam bar is used to secure the LCD screen ribbon cable in place on the white LCD cable connector mounted on the iPAQ main board. The LCD ribbon cable clam bar is easily broken or damaged when removing the screens data cable from the main board. 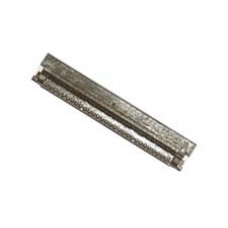 This spare iPAQ part is exactly what you need if you have managed to break your LCD ribbon cable clam bar.